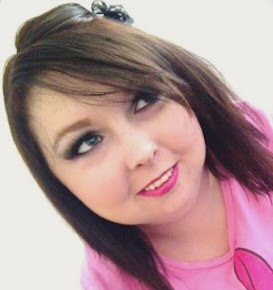 I have had this blog post on my old blog since May and I wanted to move it over onto this blog as my old blog posts may be getting shut off. So some of you may have already read this. 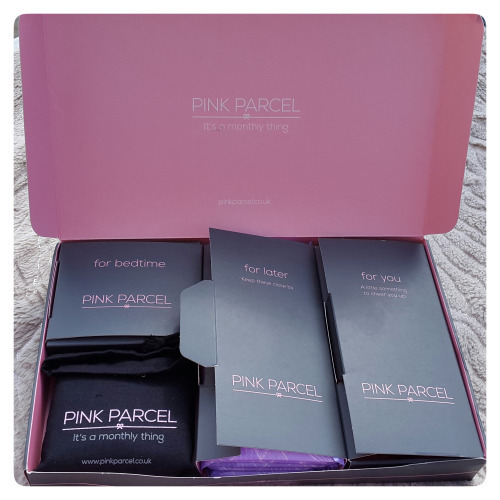 This new review blog is all about my best kept secret - it’s called Pink Parcel. If you haven’t already heard of this company them you are missing out! It’s a company just made for us girls giving us all of our needs for our periods each month! Let me just say now firstly, I am in love with this company and I think it’s an amazing idea for all women out there. Plus, for them girls who are a little embarrassed about their periods, it comes in a clear grey parcel package from the postman so no-one will even know what you are getting! There are two boxes to choose from; either young teen parcel or pink parcel for them women, like me, who are a little older. The Pink Parcel comes with your favourite towels and tampons, beauty products, tea, and something sweet to munch on. It’s like a little present from yourself to yourself each month. #1: Select a brand: They supply all your favourite brands so you don’t have to change anything. #2: Tell them your dates: Let them know when your period is due but don’t worry you can change your dates at any time. 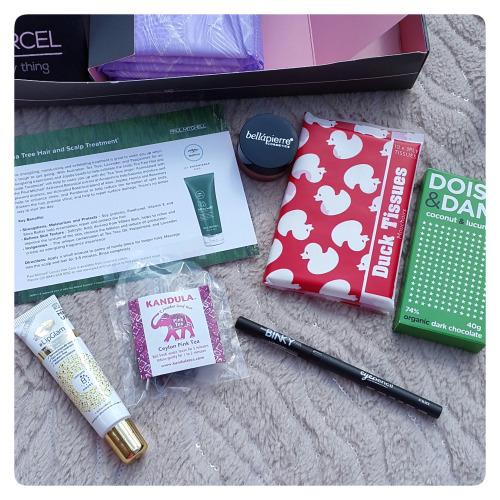 #3: Receive your parcel: You’ll receive your products and treats 3-5 days before your period is due each month so don’t panic that it won’t be there on time. #4: Relax! : Its now time to sit back, relax and pamper yourself with your Pink Parcel treats. Obviously my favourite towels! : Yes, I use towels and not tampons, reason being that I can never get tampons to feel comfortable and end up getting frustrated when trying to get them to feel comfortable and when on a period, I am always already feeling uncomfortable and frustrated with pretty much everything that I don’t need something else making me feel that way too. If you don’t use towels and prefer tampons, don’t worry you can pick to receive tampons instead of towels or you can pick both if you use both. Mouchoirs Duck Tissues: I love these! Not only are they so soft but the cute little duck design just makes me smile. And you'know when you can get them certain packs of tissues that have an awesome designed packet but the actual tissue is just cheap plain white - this is one of the rare good ones that actually has the design all over the tissues too. Doisy & Dam Organic Dark Chocolate: I cannot wait to munch this, it’s Lucuma which is supposed to be a super-delicious fruit ative to the peruvian andes, and is packed full of nutrients which is a good source of potassium, iron, zinc and B vitiams. It’s Dominican cacao, handmade in the UK, vegan and gluten free. Ingredients: cocoa mass, sugar, cocoa butter, coconut flakes (10%), lucuma (4%), coconut essence (0.1%) and vanilla powder. (It may contain traces of nuts. Store in a cool, dry place). Kanadula Ceylon Pink Tea: Pink tea. PINK tea. PINK TEA! I mean wow - this is tea and its pink, two of my favourite things. I can’t wait to try this, it also smells amazing! BINK London: Eye pencil in shade 01 black. This is just perfect for any girl from goth to glamorous! BellaPierre Cosmetics Cheek and Lip Stain: This comes in shade ‘coral’ and is a beautiful pink/peach shade perfect for the spring and summer months coming up. #LipGlam Multi-purpose Moisturiser: This is my favourite product of this month in this box. This is an 100% natural lip balm with has been dermatologically tested, it’s fast acting, paraben-free and it maintains moisture. Not only that but it can also be used as a lanolin lip balm, cuticle ointment, hair split end soother, lip and mascara primer, eyebrow balm, gives you dry skin relief, and soothes chafing and rashes. Did I also mention that this product lasts for up to eight hours? Love this! Interested in signing up for your own Pink Parcel? You can do so by clicking here, or you can check out Teen Parcel by clicking here, or you can also subscribe to their newsletter by clicking here and scrolling down to near the bottom of the page.I hope you all enjoyed this review, and have a wonderful day!